All you have to do is read the Guest Book Posts to find plenty of reasons why you should book your fishing trips with MRO Crappie Academy Guide Service. 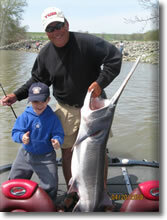 Barry is a master at finding and catching fish and he enjoys being with people who share his enthusiasm for the sport. He has something to offer all anglers and they enjoy and appreciate his fishing techniques and the tips that he shares with them. A successful touring pro, speaker and instructor. 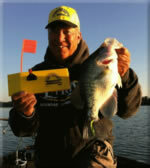 Barry has been featured on Russ Bailey's Midwest Crappie Series, has held crappie seminars and is a popular guest at boat and sports shows, state fairs, and with anglers who enroll in his Crappie Academy. When Barry isn't involved with seminar projects or with a client on the water, you can find him searching the lakes for the best places to locate crappie, bass and catfish. Even with miles of shoreline, there are few places the fish can hide from this professional fishing guide. Prior to becoming a professional touring pro, Barry was a public school teacher, coach, and school administrator. He brings this background in education to the lake where he instructs students , both young and old, on the sport of fishing. His patience, his ability to effectively communicate and his easy-going personality keep them coming back to MRO Crappie Academy for a great day on the lake. Always the family man, Barry and his wife, Lolly, enjoy visits from their son, Clint and daughter, Julie and their families. Their grandsons, Will and Eli, are the lights of their lives, and they treasure each minute spent together. The tournament experience below is a small snapshot into Barry's abilities and achievements as a top fishing pro. The guest book testimonials, the photographs in the gallery and the smiles on the faces of those who have chosen Barry as their fishing guide leave the ake with much more than an ice chest full of fish and the memory of a great day on the lake. They leave having made a new friend.